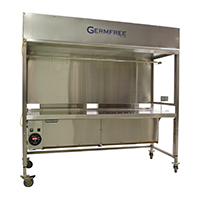 Germfree manufactures Laminar Flow Hoods for a range of biopharmaceutical applications. Our BVBI series of all-welded stainless steel, vertical clean air benches provide a high degree of localized control for critical aseptic processes and the handling of sterile products. HEPA filters, positioned above the work surface ensure uninterrupted flow of optimal ‘First Air’ to the process area. The air-return is positioned near the bottom of the unit to enhance both the performance of the cabinet as well as the overall airflow efficiency of the cleanroom. Germfree’s BZ Series of Horizontal Unidirectional Airflow Cabinets offer localized aseptic control for a range of biopharmaceutical applications. These all stainless steel units have a pharmaceutical grade finish to ensure durability and ease of cleaning. 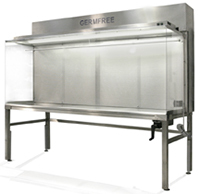 Our Laminar Flow Hoods are widely used for the handling of sterile products in cGMP-compliant production areas, USP 797 cleanrooms and 503B facilities. The ergonomic design enhances operator comfort. We offer a wide array of customizable specifications and features. The units are designed with the airflow patterns required for your process. 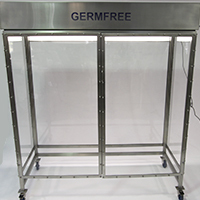 Our laminar flow workstations can be outfitted with doors or other access features to surround any devices or equipment in the critical aseptic zone. Other options may include sinks, shelving, and special lighting. For example, we build custom units that are configured specifically for lyophilizers.